Manila, Philippines - The Professional Regulation Commission (PRC) announced the schedule of application, deadline of filing as well as requirements for application in Criminology board exams for December 2018. The licensure exams for Criminologists will be held on the following dates at various testing centers in Manila and Regional Offices nationwide. Below is the detailed schedule for 2018 CLE as per PRC Resolution entitled “Schedule of Licensure Examination for the Year 2018”. 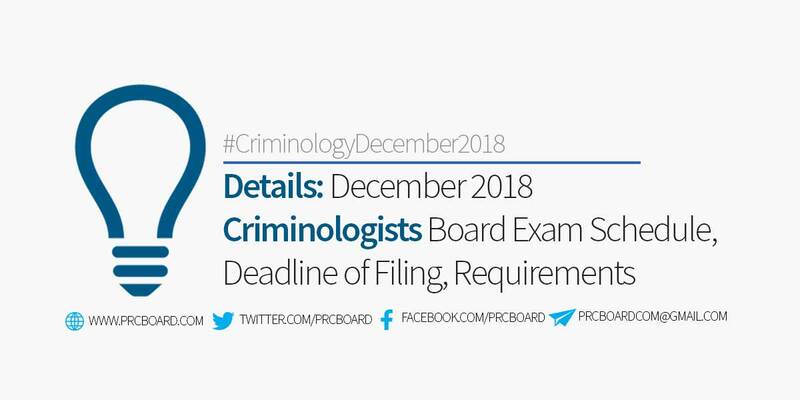 The program for December 2018 Criminologist board exam will be posted here as soon as PRC releases online. The most recent Criminologist board exams were conducted on December 2017. A total of 13,025 out of 36,516 (35.67%) examinees passed the exams. Below is the statistics of CLE results in the last three (3) years. To receive fast and reliable news and announcements regarding the Criminology board exam for December 2018, we advise our visitors to bookmark this page, visit PRC official website, follow us at our social media pages via Facebook and Twitter or join the members discussions at our Facebook Group. Mam pa anu poh mahanap ung online applicati0n f nah save vah 0r walah? Anong website pwdeng pasukan para mag online for criminology? Thanks 1st timer . Ask ko lng po sana totoo vha sa oct 15 ang lng filing... Confirn ko lng po sana? Kaylan ba ang online filing mga gago kasi dito mkita sa gogle mga bobo wlang kwentang tanong sa mga buysit na nkakaalam sa board exam sa criminology mga putang ina nyo.. Salamat.ngpapaliwanag lng.